Need the Right Solution for Your Retail Business? See What We Have in Store for You! Trusted delivery solutions and dedicated experts who take pride in their work—that’s what you’ll always find at RDS Same Day Delivery! 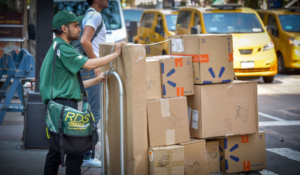 Specializing in retail delivery services in New York City, our trained and friendly couriers are passionate about helping your business succeed. Let us know what you need for your business, and we’ll make it happen! E-commerce has drastically changed the retail industry. Now more than ever, businesses need to develop a smart strategy for home deliveries. This is where our team at RDS Same Day Delivery can help your business. Utilizing the most advanced technology, our messengers in New York City will complete your big-box deliveries with accuracy and care. With decades of experience under our wings, we know that customer satisfaction means everything to your business. That’s why RDS Same Day Delivery only hires friendly, respectful couriers who genuinely care about your customers’ best interests. Do you need to ship something quickly in the local area? Take advantage of our truck delivery service in NYC to reliably meet your deadlines and keep your customers happy. Or, if your package is smaller in size, our couriers will navigate the city streets to complete your delivery both quickly and efficiently. With an on-time delivery rate of 98.7%, we are proud to employ only the fastest couriers for our messenger service in New York City. Managing your own shipping operations can weigh down your business. Rather than doing the work yourself, it’s often smarter to outsource your logistical needs with experienced professionals. When you partner with us, we use our experience and resources to boost your bottom line. Contact one of our representatives, and we’ll work with you to develop a plan that fits into your business model—not the other way around. Time-sensitive food pickups. We specialize in timely and reliable food pickups using our refrigerated trucks. Just let us know where the food needs to go, and we’ll get it there. Retail inventory distribution. Space is expensive in NYC and every possible inch should be dedicated to generating revenue, not warehousing inventory. Providing regular inventory fulfillment, we’ll pick up your inventory from a New Jersey warehouse and then distribute it to store locations throughout New York in the evening. Working with all of your specificities. If a delivery company doesn’t properly care for your products, then you have a disaster waiting to happen. At RDS Same Day Delivery, we partner with local retailers who need special handling for their cupcakes, ice cream and other specialty items. Simply put, we give your products the VIP treatment to keep your business growing and your customers happy. Get a quote online to begin your project with us right away.